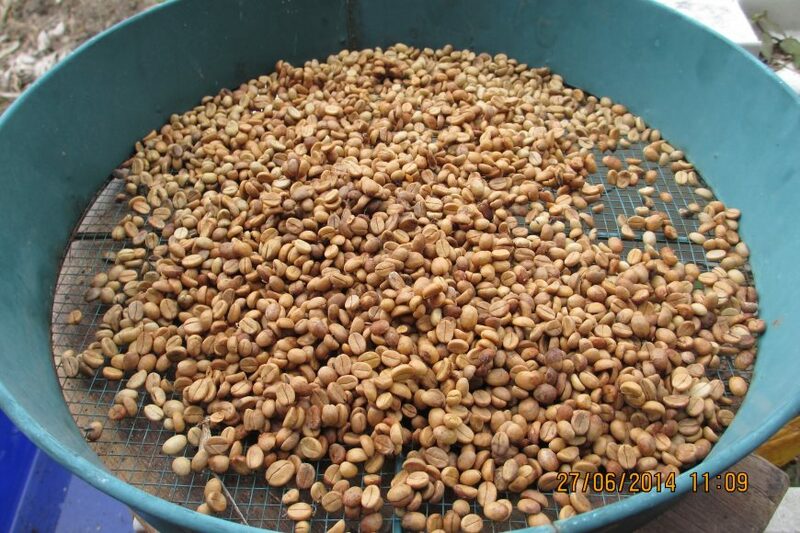 Zone 0: Many of the wet season crops are now finished and need to be preserved for the long dry season. There are numerous ways of preserving each crop. You can store everything in the freezer in serve size packs. The serve size is determined by the use of the product. For example if cassava is regularly put into a stew then the serving size is the amount that you could add to a stew. Cassava can be dried, cooked by boiling with the lid off the pot and then stored in the freezer. Freezing works well. Cassava can also be stored in the ground for a little while but becomes to large and stringy if left to grow for too long. Yam stores well in a cool airy place. I store mine in the shed and this does surprisingly well. It can also be boiled and frozen as for cassava. It is so difficult/uncomfortable/slimy to peel that I usually clean it, boil it in the skin and then peel it. As it will store in the shed I don’t use this method. Why waste electricity when you don’t have to? Turmeric also stores well in an airy shed. It can be frozen but goes a bit rubbery if allowed to defrost. It can also be stored in the ground over the dry season and will reshoot next wet season. Ginger, Chinese Keys and Temulawak are all best stored in the ground where they grow. They will keep for a few weeks in the fridge but lose their pungency. They can also be preserved in alcohol. Sweet potato I harvest when I need it. It can be cooked and frozen but is much better fresh. Once again why make work and expense for yourself. 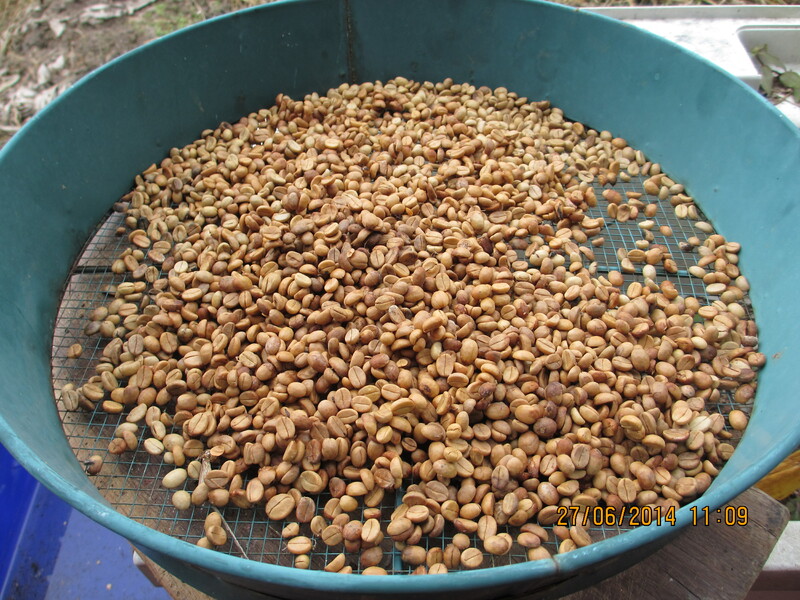 Coffee beans are harvested and soaked to remove the outside flesh. How long? Good question? I always forget them till they are bubbling. I am still on a steep learning curve here. Zone 1: Keep up the good work and enjoy the rewards of the fresh and crunchy vegetables and greens. The okra is producing well and the fruit are nice enough to eat as a baby vegetable in the salad. Snow pea tips are a great treat. They never make it inside to the salad! Zone 2: Maintain weed control and watering under the mulch in this area. Grasshoppers are enjoying themselves till harvested as chook or fish food. The heat lovers like cha plu and sweet leaf are having a rest in the cooler weather. Scoot out early to hand pollinate the pumpkin flowers. Harvest the growing tips and excess male flowers for use in the kitchen. This increases the usefulness and productivity of the plant and tastes great. Zone 3: Make sure that the weeding and mulching are completed so that the ground retains moisture for as long as possible. Fertiliser and trace elements can be applied under the mulch. Citrus are currently fruiting and can be temperamental in the tropics. If the flesh is dry add Boron at the rate of ½ a handful per tree. If the fruit are not sweet then add Magnesium at the rate of 1 handful per tree. Zone 4: Check growth particularly looking for material growing through the fence and tidy up. Clean out the dry material from the lemon grass and use it as mulch. The lemon smell is amazing and lasts for a little while. Zone 5: Maintain mulch and look out for any fruit ready for harvest. Zone 1: Broad beans making good progress and worms powering along. The transplanted lettuces took off with the rain and have been lush and colourful. Strawberry runners are settling into the vertical garden. Very grateful for rain to water the beds, fill the tank and free up time and energy. Zone 2: Recently sown garlic is now 15cm tall. I’m hot composting in the front garden where I’m considering planting a cherry tree later this winter. The compost consists of old straw mulch that had become a bug haven, nasturtiums, citrus prunings, food scraps, lots of coffee grounds and fruit/veg juicer pulp from local cafes, comfrey leaves, free stable manure, shredded office paper and ancient pine needles that have lost most of their piney oomph…hoping they’ll just tip the pH a little towards the acid side to help neutralise our slightly alkaline soil. They also make a lovely fluffy blanket on the outside to hold warmth in the heap. Zone 3: Stone fruit trees on the northern boundary are now bare and letting sunlight in to the rest of the garden. Apple and mulberries hold onto their leaves a bit longer and thankfully are out to the east and west where it doesn’t matter at this time of year. Washington navel orange trees have been loaded to the point of dropping many of their fruit (they say oranges don’t rely on bee pollination but our crops have been huge since the bees arrived!). Imperial mandarins are finished and Emperors are just colouring up, while potted limes are crying out to be planted into good soil when it warms up in spring. They will have to make do with plenty of seaweed extract, compost and ‘man power’ (read: special watering can next to the loo) until then. Soursobs are still putting in a sterling effort. There are always a few that get away to fly the flag next year. The tops can go into hot compost, or – Mum’s favourite way – into a black garbage bag in the sun to slowly melt down to rich black organic matter over some months, with no turning required. Zone 4: Weeding out introduced grasses and trimming back native shrubs on the road verge after flowering. The Templetonia retusa (cocky’s tongue) has been really spectacular this year. Looking forward to the Acacia glaucoptera (clay wattle) bursting into little yellow balls of fluff soon. Zone 1: July is the time when water-based are truly valuable. Watercress is an easy and plentiful green. Vegetable seedlings are slow to rise but some plants such as native raspberries, begonia and sage flowers are being harvested weekly. Zone 2: Ash from the fireplace is spread on the paths to deter snails from tender young seedlings and to kill weeds in the path, it also works to correct the acidity of our soil. Many of the soft herbs have died back although this year the plants are very confused and the mulberry trees have fruit three times this year. The leaves and neighbours grass clippings are piled high to make rich hot compost beds that will become intensive gardens next spring. Zone 3: the choko vine has slowed down but we can still harvest leaves to cook, the sweet potato is very thirsty and hibernating, the potted worm farm towers are a good way to keep the soft kitchen herbs running (we plant them in the top section). The bananas are still being harvested and the stems cut to feed the geese after harvesting, the leaves are used to cook Balinese deserts. Zone 4: This is the celebratory time of the year for Zone 4. As we harvest dead wood we tend our mini forest with delight and gratitude. Many trees are having a haircut and the larger timbers are first used as garden edges, then as and when required they are cut up for the stove. My favourite activity in July is what is known formally as a ‘hazard reduction burn’. We pile up woody weeds all year around. We have to ensure that any pieces of woody weeds don’t take root in the moist soil at the bottom of our garden, so we make a big tipi. Then, when the fire hazard is low, we light it up, invite the neighbors and cook treats in it as it settles down. David Holmgren writes about the amazing power of simple resources such as wood because it is a resource that people can learn to use quickly. It is in our heritage and the memories are quickly rekindled. Zone 5: Many of the trees stand naked and we can see a feral beehive, hiding possums, water-dragon nests and birds clowning about in the canopy. The trees that block light to the house by refusing to rest are being trimmed. This is the time of year that new projects are easiest to tackle such as making new paths in the forested areas because the days are not too hot and the ‘weeds’ are sleeping.